Any time you bring up marijuana and addiction in the same sentence, a lot of people get really defensive. Whether it is people claiming that cannabis has enough medical benefits to negate any side-effects, or people deflecting to other “hard” drugs like opioids to minimize the impact of marijuana, it is difficult to even broach the subject. Before anyone reading this goes on the attack with “how dare you speak poorly of cannabis” we suggest reading this article until the end. It is hard to have a conversation about just addiction in general without the debate of marijuana abuse being brought up. Both sides of the argument have some fair points of perspective, but at the end of the day to insist marijuana addiction is utterly impossible is just intellectually dishonest. It may not be as devastating or deadly as heroin or crack-cocaine, but marijuana is addictive. And just because not everyone suffers, doesn’t mean we should neglect the people who do. So if we are going to say marijuana is addictive, we have to cover the basics. While there are numerous side-effects, there are no reports of fatal overdose in humans caused by cannabis. The earliest records of cannabis use date as far back as the 3rd millennium BC. Throughout history, it has been used for recreational, medicinal and spiritual purposes across several different cultures and continents. Even though there have been restrictions put on cannabis since the early 20th century, more recently America has experienced a change of perspective, and more and more people are embracing marijuana reform. We aren’t saying that is the end of the world. This change in drug policy could do a lot of good in many ways. But that does not mean that people should forget that marijuana is addictive. One big element of addiction is how despite the negative impact of using the drug on an individual’s life, they continue to use. It causes damage to their professional and personal life, and yet they have an inability to stop using. Over time, people suffering from substance use disorder will build up a tolerance to the substance. This means they require larger amounts of the substance to feel the same effects. Perhaps one of the biggest issues with people accepting that marijuana is addictive is the stigma that comes with the word addiction. Far too many people still believe that addiction is a choice or a weakness of character. Therefore, it puts cannabis in a bad light if you acknowledge marijuana addiction. If you believe that addiction is only for those who have weak willpower and choose to destroy their lives with dangerous drugs then, of course, you won’t want to believe that marijuana is addictive. So, for just a moment let us pretend that everyone acknowledges what addiction actually is- a chronic brain disorder. When we talk about the dangers of drug dependence and addiction, people tend to envision an alcoholic falling off a bar stool, or an addict with a needle in their arm. For decades, movies and television have helped paint this picture. In the midst of an ongoing opioid crisis in America, we see plenty of heroin and fentanyl overdoses on the news to reinforce that stereotype. But that is not what every addiction looks like. Still, if we focus mainly on making comparisons to try and debunk that marijuana is addictive, we can prove some points there as well. For instance, look at one of the most dangerous drugs in the world- alcohol. The World Health Organization (WHO) estimates that there are approximately 3.3 million deaths worldwide due to harmful use of alcohol every year. Yet, this drug is legal pretty much everywhere and readily available all over the United States. In truth, alcohol is responsible for far more death and destruction than cannabis. And you will notice that not everyone who drinks alcohol becomes addicted to it. The same can even be said for opioids since millions of Americans use prescription opioids for pain management, but do not end up addicts. Cannabis is not the only substance with medical potential that people can abuse. It may not be as dangerous as morphine, but that doesn’t mean it is exempt from what defines an addiction. Why? Because that is not how addiction works. Be it narcotic medication, illicit street drugs or recreational alcohol use, substance use disorder can develop depending on many variables, including genetic predisposition. When addressing addiction and the stigma, we have to remember that the substance itself is not the only factor. Let us get this out of the way- I am NOT saying marijuana is as addictive as heroin. An interesting fact about marijuana that most people do not realize is that there is a significant amount of interaction between the cannabinoid receptor system and the opioid receptor system in the brain! Yes… marijuana activates the same receptor system in the brain as heroin, morphine and oxycontin. Research shows that without the activation of the µ opioid receptor, THC does not activate the reward system as it normally would. When marijuana activates that opioid receptor it sets off a chain reaction. The opioid system activates the dopamine reward pathway, which gives people those feelings of euphoria. These are the mechanisms believed to underlie the rewarding, and many of the addictive properties of essentially all drugs of abuse. Go ahead… let that sink in. On top of all that, without the activation of the CB1 receptors, research shows that opiates, alcohol, nicotine and perhaps even stimulants would lose some of their reward properties as well. That would mean that the reward effects of more notorious drugs depend on cannabinoid receptors more than previously expected. 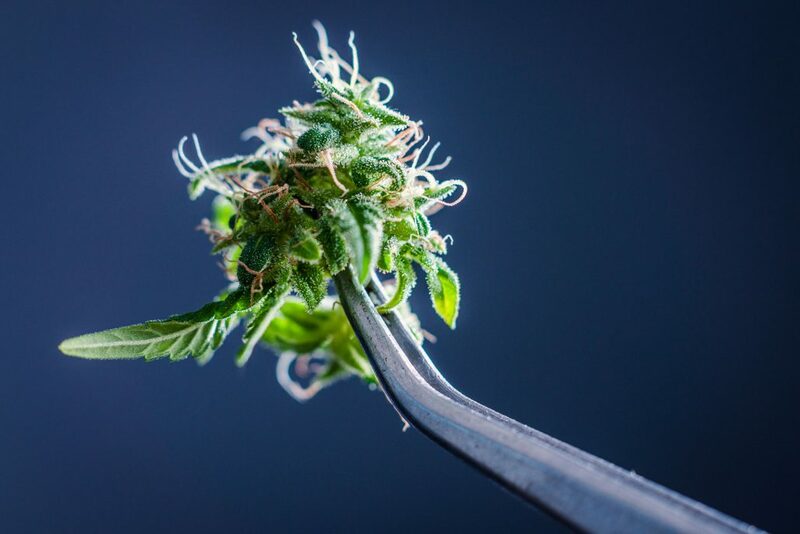 In short, the data indicates there is a close connection between the cannabinoid receptors that THC targets and the addictive elements of most other drugs. How does that suggest that marijuana is addictive? Well, if we agree that addiction includes how a substance changes the way a brain functions, we can see how the impact of THC on cannabinoid and opioid receptors could play a role in the development of marijuana addiction. We learn to rely on substances and outside resources for dopamine. Even if someone does not experience painful and dangerous withdrawals, it does not mean the substance is not addictive. Again, a lot of how marijuana addiction develops has to do with the impact on the brain and how drug use impacts an individual’s life. Marijuana addiction is not as common or life-threatening as opioid addiction. However, reports indicate that marijuana addiction rates are on the rise in many areas. Approximately 9% of cannabis users because addicted, according to the National Institute on Drug Abuse (NIDA). In 2015, about 4.0 million people in the United States met the diagnostic criteria for marijuana use disorder. Recent NIDA data indicates that at least 30% of those who use marijuana have some degree of marijuana use disorder. That does not mean that all those people have an addiction or a severe substance use disorder. It does mean, however, that they are showing signs of dependence. Many believe that the rising rates of marijuana addiction are due to the increase in potency. Currently, cannabis products are more potent than ever before. New trends like dabbing THC concentrates are also being considered as contributing to the rise in marijuana addiction. Even the National Cannabis Industry Association does not disagree with the reports about marijuana addiction rates. The organization’s chief spokesman Morgan Fox said he is not surprised that the government cannot convince people that marijuana addiction is a real thing. Even leaders in cannabis advocacy can admit that it is possible to become addicted to marijuana. At the end of the day, some people are more than happy to refute any evidence that marijuana is addictive. Some people become aggressively hostile to any suggestion it could be. But here is the thing- you can be an advocate for the benefits of cannabis and acknowledge it is addictive. You’re allowed to do both. You can advocate for a substances medical potential and the many uses for its compounds that make people’s lives better and raise awareness about the risks some people face. If you want to promote the positive aspect of things like CBD oils and medical marijuana for treating Veterans with PTSD, that is a noble cause to consider. But that does not mean you have to ignore those who struggle with substance use disorder. Every day, millions of Americans struggle with chronic pain and the medications that help with pain management are an important resource. That doesn’t mean we should ignore the fact that people do become addicted to Oxycontin. Marijuana is addictive. It may be less common or life-threatening than other drugs like fentanyl or alcohol, but a growing number of people across the nation are still struggling. Addiction treatment facilities are reporting higher demands for marijuana addiction treatment, and more comprehensive recovery programs are helping address drug abuse in all its forms. For those who do suffer from addiction, there should be support and opportunities for compassionate care. Holistic addiction treatment is about addressing every part of an individual. It is a personalized path that is designed to treat the mind, restore the body and heal the spirit. For over 20 years, Palm Partners Recovery Center has been helping people transform their lives, no matter what drug they struggle with. If you or someone you love is struggling, please call toll free now. We want to help.